If I say Twitter, do you think I’m giggling at you like a goofy schoolgirl—or do you start talking in a bunch of birdie buzz words like tweet, tweeps, or twoosh? Aries - Short, rapid fire, outta there. Taurus – Slowly betwn snacks. Gemini – All day, night, in sleep. Cancer – Can’t nurture tweeps enuf (friends/followers) in 140 chars. Leo – Big, bold, look-at-me tweets, backgrounds. Virgo – Precise, planned in advance, hates to shorten words. Libra – RTs (return tweets or forwards) lots of others’ tweets, own are nice ‘n’ sweet. Scorpio – Watches tweet stream intensely in silence, then tweets alone late at night with mysterious phrasing. Sag – Jokes, fun, big statements in spurts then off on adventures. Capricorn – Biz-related and biz-building. Aquarius – The odder the better. Loves e-communities. Pisces – Merges, becomes one w/tweet stream. Often goes missing. Follow me on Twitter. Or once you've got your account, go to the Find People tab and enter my screen name, JoyceMason (no space--grounded!). See my tweets anytime by clicking this link of my RSS feed. To learn more Twitter terms, consult the twictionary. Want more Twitter humor? Read Humor: The 10 (Actually, 11) Commandments of Twitter on Hot Flashbacks, Cool Insights. 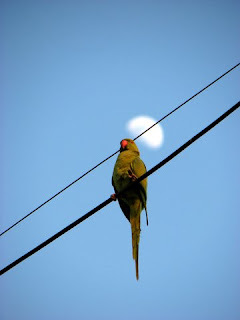 Photo description: A parrot perches on some wires with the moon in clear blue skies in its backdrop. A parrot is normally used by fortunetellers in India to tell the fate of a person and the moon is definitely an influencing factor in astrology. Both of these elements in the image make it very much related to the concept of future.